Solve the last 3 edge cubies. Combine Y-moves with U-moves to solve the remaining three edge cubies. We choose to solve the green-orange cubie first and see what happens to the remaining two cubies in the top layer. The tricky bit is that any Y-move will affect three edge cubies simultaneously. There are three cases to consider, and they depend on the number of swaps and the number of flips required to solve the final three edge cubies. Recall that a single Y-move does two swaps and one flip. Therefore, more than one Y-move may be required to do several flips, and if just one swap is required, we have to do combine the Y-move with additional U-moves. check whether one of them solves it all. flipped, you can solve it with two Y-moves. Suppose green-orange is solved, but the remaining two cubies are not solved. There are three cases. 0 swaps and 2 flips. We need two Y-moves to undo the flips. finish with Yi sideways to the right. 1 swap and 0 flips. with X = UFiUiF, we do U X U X U.
orange-yellow and green-yellow does not help. 1 swap and 2 flips. in the previous cases. Order doesn't matter. The basic issue solving the last edge cubies is that a Y-move corresponds to two swaps of edge cubies. Several Y-moves will therefore do an even number of swaps. If our scrambled cube happens to require an odd number of edgie swaps, then we can solve most edge cubies with Y-moves, but a single swap remains to be done in the end. However, since a single U amounts to three swaps, which is an odd number, we can find a solution involving an odd number of U-moves. As it turns out, there are four simple moves based on U and Y (sideways) that can swap the last two cubies. Those are UXUXU, UZUZU, UiXiUiXiUi, UiZiUiZiUi. That is, we don't even have to remember the direction of the U-moves or the sideways Y-moves. We motivate UXUXU et al. by noting that a Y-move involving the two swapped cubies apparently does not help, so we throw in some U-moves and operate on orange-yellow and green-yellow separately. Actually, I find an alternative viewpoint based on counting swaps easier to remember and more satisfying as well. Let's take the observation that 1 Y-move does 2 swaps to heart. 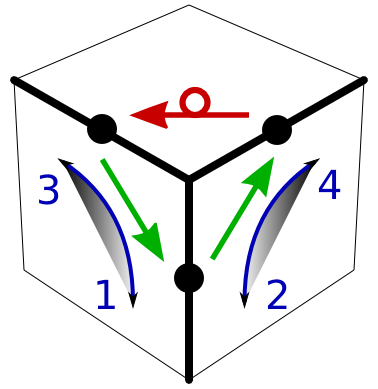 If we notice that to solve the final edge cubies requires an odd number of swaps, then we know right away that our 2-swap Y-move cannot do it by itself. However, we also know that a single U does 3 swaps. 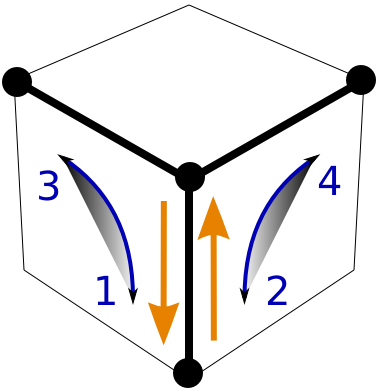 Therefore, faced with a cube that requires an odd number of edge-cubie swaps, we can do a single U turn to obtain a cube requiring an even number of swaps. This fits well to our standard strategy of prepare, Y-move, restore. If we prepare with U and restore with Ui, this does not change the number of swaps. Doing any number of U-moves and restoring with their inverses does not change the number of swaps. Being aware of the swap count therefore suggests the following alternative strategy for solving the last 5 edge cubies. Before you get started, count the number of swaps required. If the number is even, do nothing. If the number is odd, do a single U turn. Then solve the cube with U-prepare, Y-moves, U-restore, taking care that there always is an even number of U moves, which in fact is our default strategy. The single-U swap-adjustment strategy actually works, since the laws of the cube 'preserve' the swap count. Once the cube is in a state requiring an even number of edgie swaps, we can solve it with an even number of U-moves and some arbitrary number of Y-moves. Red-yellow and blue-yellow are solved, but we realize that we are off by one swap. Start with a single U. Now green-yellow is solved, but red/blue/orange-yellow are not solved. They require 2 swaps. The moves X and then UXU are an efficient way to do those 2 swaps. In practice, we may want to do that single-U swap-adjustment earlier, say after solving just 1 or 2 of the last 5 edge cubies. The closer we are to solving all 5, the easier it is to count the swaps. Ignoring the swap count may mean that we solve edgies that we have to redo in the end. If we adjust the swap count early, we will never encounter the 1 swap with 0 (or 2) flips configuration. Initially, we count two swaps. Red-yellow and orange-yellow are in the solved position (ignoring orientation). The other three could be positioned correctly with two swaps: green-yellow with blue-yellow, then blue-yellow with green-orange. The result happens to be the 1 swap, 0 flip example given above. Notice that there are 2 swaps initially. We can preserve the even swap count by keeping orange-yellow in place. Solve green-yellow first because it is conveniently located near orange-yellow: UiXU. We use X to get the flip right. Then a Ui2 puts the remaining three unsolved edge cubies into our work space. Do Y and restore with U2. We get lucky and no flips remain. Adjust swaps after solving one cubie. Same starting point as above, but we already solved blue-yellow. Count swaps, 3 are needed. To obtain an even number of swaps, we want to do a single U-move. We choose between U and Ui based on the number swaps and simplicity of the resulting position. Ui gives a complicated 4-swap position. Let's start with U instead, giving a 2-swap position. Use U Zi Ui to solve blue-yellow and orange-yellow. The result is a 0 swap, 2 flips position. In conclusion, to fully appreciate the Y-move, we want to be aware of its 2-swap property. However, if you find this entire swap-count business confusing (or, like me, sometimes make mistakes in counting the swaps), don't worry. Just solve until only one or zero edge swaps remain. If you need one swap, just do a single U-turn and solve again. Elegantly with UXUXU if you remember, or just start over and solve with the standard Y-move strategy.